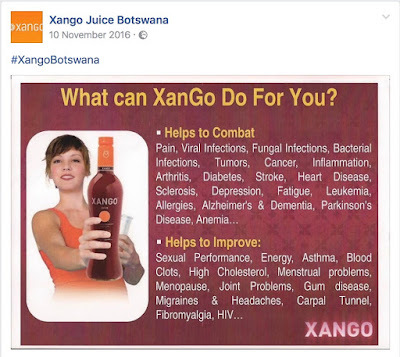 Is Xango juice yet another scam like Noni, Aloe, etc? It's already doing rounds in the city with exorbitant price tag. I've done my little research and I'm sceptical. I believe that there's no magical fruit that cures all diseases. Thank you so much for being sceptical. If only more people were sceptical then we wouldn’t have so many people in desperate trouble. We wouldn’t have people falling for pyramid and Ponzi schemes and also for their cousins, the Multi-Level Marketing schemes. Despite what their recruiters say, even the legitimate ones like Amway and Herbalife won’t offer you the financial freedom and lifestyle opportunities they suggest. Their own figures even prove this, showing that almost everyone who joins a MLM scheme either makes no money or makes a loss. Xango is another MLM scheme based on the sale of a drink that appears to be miraculous. A post in the Xango Juice Botswana group on Facebook suggests it has an enormous range of benefits. They say that it “fights bacterial infection” and that it can “help with anxiety and depression, help reduce allergy symptoms, improve gum health and eye health, reduce nerve pain, lower fever, lower cholesterol, stimulate red blood cell growth”. Apparently it can also help combat viral infections, cancer, diabetes, leukemia, Alzheimers and dementia and can help improve sexual performance, asthma and HIV. Best of all perhaps, their juice can “slow aging”. Let’s be perfectly plain. This is nonsense. This is a lie. There is no magical juice that can do all these things and all the other things they claim. If there was someone would have already won the Nobel Prize for Medicine. Funnily enough, they haven’t. I’m not suggesting that Xango juice is harmful, it’s just not possible that it can do all or even any of these things. It’s just a fruit extract drink that sells for P350 per bottle. You would be better to go to your local supermarket and stock up on some fresh fruit and vegetables. Then cook yourself a healthy meal, drink lots of water and get some sleep. And take a little bit of exercise as well. That’s the only way you can live a healthier life. The only thing that Xango juice will do for you is to help you lose weight. The weight of your wallet. Late December I bought a phone at a store in Rail Park and within a day of using my phone it could not read my sim card. I waited for the holidays to pass and after 5 days of purchase I returned the phone. They took it for testing and told me that their policy says it takes 21 days to fix their phone and they do not provide me with a phone i can use for the mean time. After 21 days the phone was not fixed and it came 43 days later still not fixed and they told me that its my fault, I damaged the phone. How can I advance my matter forward, I feel like I’ve been robbed day light. Please help. I know this doesn’t help but at least you now know where you shouldn’t buy a cellphone in future. Clearly they don’t deserve your money if they take so long just to give you an excuse why they won’t fix your phone. I don’t see why it should even take three weeks to identify what’s wrong with it. Taking two months is unacceptable. Section 15 (1) (b) of the Consumer Protection Regulations says that a supplier has failed “to meet minimum standards of performance” if they quote “scientific or technical data in support of a claim unless the data can be readily substantiated”. Just saying that it’s your fault and that you must have damaged it isn’t good enough, even if it’s true. They are required to substantiate that claim and I think that means they need to give you a technical report explaining exactly what’s wrong with the phone and why they concluded it was your fault. I suggest you go back to the store and explain that the law says they need to substantiate their claim. Tell them you need a written report from an expert and that until you get that you’re going to keep on pestering them about this and your rights.